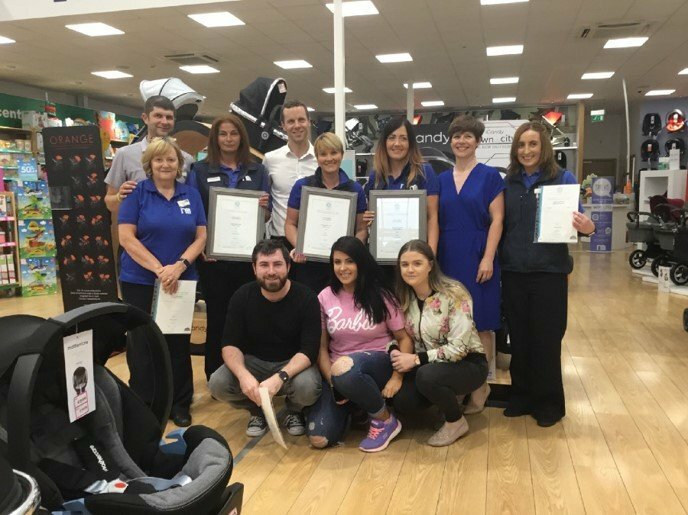 On Monday 11th June 2018, the fabulous team at Mothercare Ireland Mahon Point celebrated as they were awarded their Retail Ireland Skillnet QQI Certificates for the range of occupational training courses completed. On the day, our very own Margaret and Irene joined Jonathan Ward the Managing Director, Mothercare Ireland, Ian Malone, the Mahon Point Store Manager and Karen Ferris, the HR Manager of Mothercare Ireland, to celebrate with the team. Team members Ita Leahy, Claire Murphy and Martina Quinn were awarded their Retail Ireland Skillnet QQI Certificates in Retail Practice. The Retail Practice award is bestowed on learners that have completed the suite of eight occupational training courses. Melissa Murphy and Carmel Flood were both awarded their Retail Ireland Skillnet Retail Accessor Award. On the day, we issued awards for Warehousing, Retail Communications, Retail Security and Retail Customer Service to Cormac O Donovan, Ian Malone, Jessica Long, Rebecca O Connor and Sarah Edel Murphy. Massive congratulations to all the Mothercare Ireland Mahon Point team on the wonderful achievement. The team here at Retail Ireland Skillnet are so proud to be working with the great team at Mothercare Ireland, who have created a wonderful culture of training and education for their employees. The Level 5 Occupational training courses have been developed by retailers and are delivered both in the business through organisational-paced training and/or workshops. The organisational-paced learnings model is the one the majority of retailers are opting for, as it creates a culture for training and education from within the business. How does it work? On the expression of interest from a retailer, the team here at Retail Ireland Skillnet will work closely to create the ideal training strategy for the business. Thereafter, we will train and support accessors from within the retail business, who are responsible for mentoring and guiding employees with their learning. Thereafter our team will work closely with the accessors, the HR manager, and the owners to ensure the organisation is embracing the training and the organisation is achieving their desired results. The workshops are ideal for retailers that want to fast-track training for any of the occupational training courses, we can arrange specific dates and deliver the training specifically for the retail organisation if there are between 15-20 employees to complete the course. To find out more about the Retail Ireland Skillnet Level 5 occupational training courses such as Retail Customer Service, Retail Selling, Retail Communications, Retail Security, Retail Display, Safety and Health at Work, Warehousing or Personal Effectiveness, contact us on 074 91 76853 or email to info@retailirelandskillnet.com.